If you had eight Booster Gold autographs and Booster gave you eight more, how many autographs do you have? 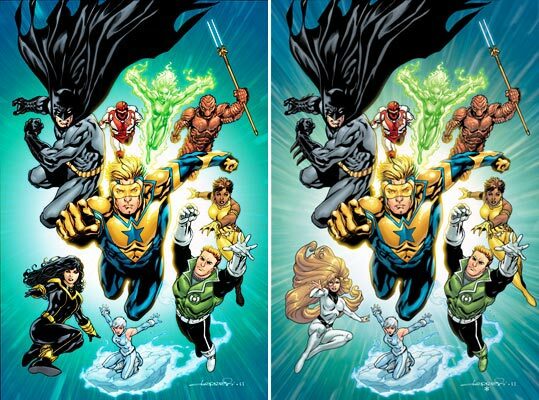 If there were six villains, and Booster Gold defeated three of them, how many villains remain? I mentioned on Wednesday that I was going to be picking up a copy of Young Justice #4. I've actually been buying all the Wonder Comics titles, and I like most of them. (Wonder Twins is my favorite.) A great deal of what I like is the lighter tone of the books. I have a tendency to complain about the "grim and gritty" nature of the contemporary DC universe. That makes me part of the problem. DC has, in fact, published plenty of "lighter" fare in recent years featuring the characters that I know and love, and I've done a poor job of spotlighting those. The best was unquestionably Justice League Unlimited, based on the Cartoon Network cartoon of the same name. The series ran for 46 issues from 2004 through 2008. 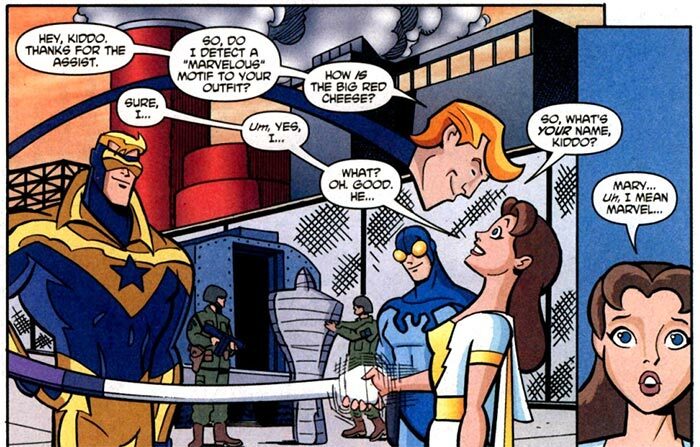 Booster Gold appeared in many of those, including issue 20, released on this day in 2006, in which he helped welcome Mary Marvel to the Justice League. The issue is a great example of the series' traditional, family friendly super hero hijinx that got me into reading comic books in the first place. The story, "Just Us Girls" by Paul D. Storrie, borrows notes from Booster's mainstream DC universe history while introducing readers to Mary Marvel and "girl power" fisticuffs. It's a delightful read. Advance reviews of the movie Shazam!, opening today and focused on Mary's big brother Billy, indicate that it aims to be in the same vein. I wish it was based on the original Fawcett Whiz Comics characters and not Geoff John's New 52 re-invention of them, but I applaud DC and Warner Bros for at least trying to reach an audience other than fans of the black-as-night Zack Snyder film universe. Beggars can't be choosers. Ooh! This looks good! I wasn't aware of it! I watched Shazam and thought it was pretty good, but flawed, and the reimagined version of Dr. Sivana was especially flawed. It felt like the writers wanted to have a grim version of Black Adam and changed their mind at the last minute. I liked its portrayal of Pedro and the other kids. They were a pretty good addition to the Captain Marvel mythos. If you had four Booster Gold autographs and Booster gave you nine more, how many autographs do you have? If a villain held eight hostages and Booster Gold freed five of them, how many hostages remain? "Blue and Gold." It's a simple phrase that means silly good times and brotherhood. Blue Beetle and Booster Gold have been best friends since their earliest days together in the Justice League International, and fans soon took to the shorthand way to reference their unique brand of bromantic hijinks as "Blue and Gold" in letter columns and on issue covers. 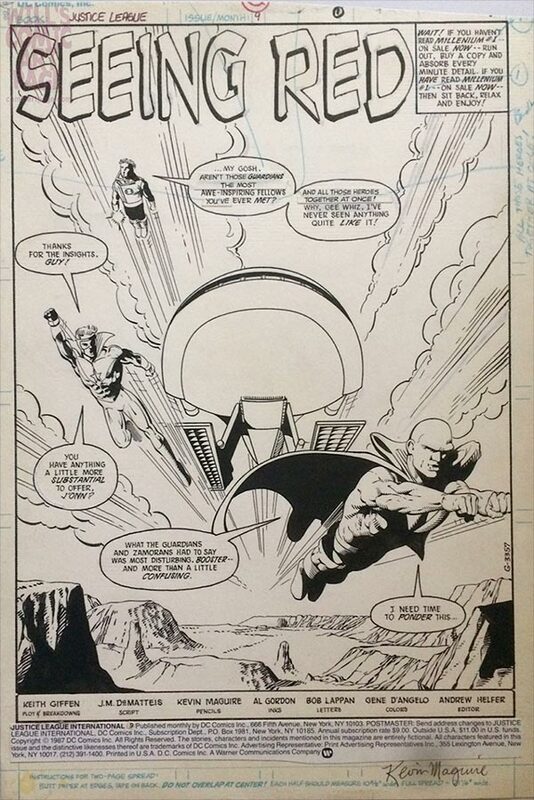 But when did the phrase first appear within the DC Universe itself? That's the question that Brian Cronin, long the best part of the website now known as CBR.com, recently answered in his "When We First Met" series. 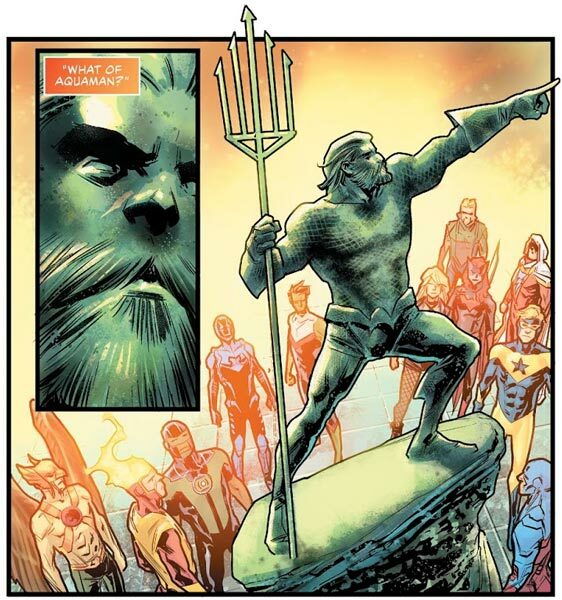 The answer: Justice League America #53, as spoken by Blue Beetle himself. Actually, the article says it first appears in Justice League America #52, but I just looked into my own long boxes, and I'm certain it was #53. To be fair, the image accompanying the text is for #53, and #53 was indeed the first issue of the "Breakdowns" story as indicated. So we're going to chalk it up to an accidental typo. Forgiveness is very "Blue and Gold." UPDATE: Cronin has corrected his typo. Making up for your past mistakes is also very "Blue and Gold." 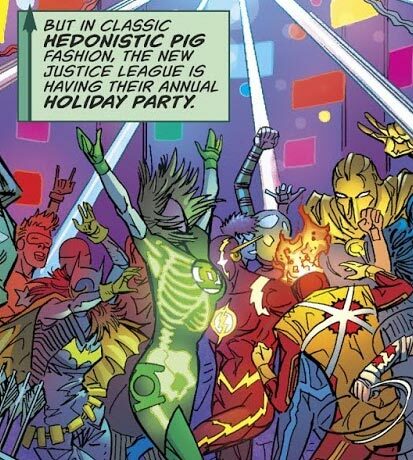 If Booster Gold had nine costumes and Doomsday destroyed two of them, how many costumes remain? 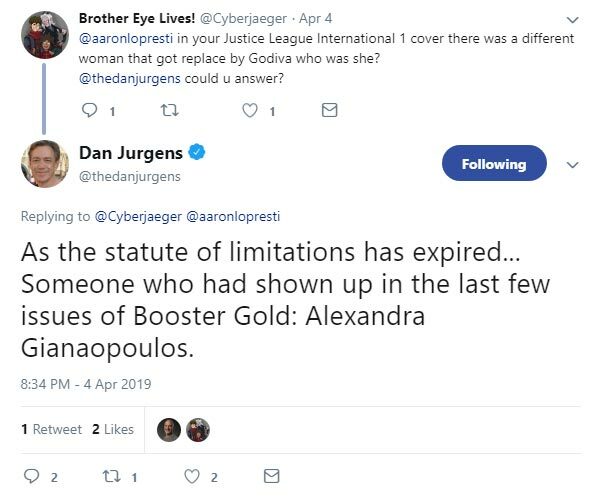 If Booster Gold gave two news interviews and then gave nine more, how many interviews has he given in all? If a villain held seven hostages and Booster Gold freed five of them, how many hostages remain? If there were three villains, and Booster Gold defeated two of them, how many villains remain?